Caltrans District 7@CaltransDist7 This was State Route 23 (Decker Road) on Saturday 2/2. This section, north of #PCH (Route 1), is still closed as #Caltrans continues cleaning mud and rocks. 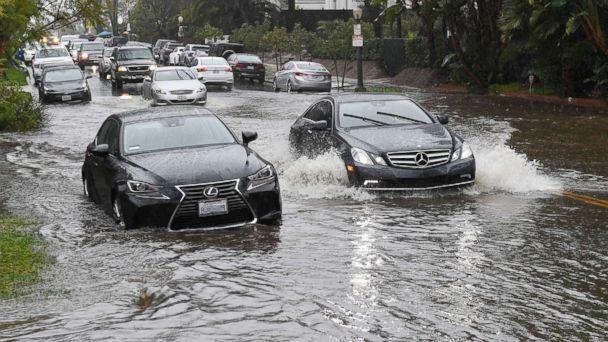 http://Quickmap.dot.ca.gov 7:20 PM – Feb 3, 2019 Flooding also occurred on the Los Angeles River in Glendale, with raging waters flowing down the Pacific Coast Highway, as did damaging winds, with gusts of up to 76 mph measured at Point Conception.Members of the San Bernandino County Sheriff’s Office had to rescue an elderly man trapped in his car as water rushed around him in the Yucca Valley, video posted to the sheriff’s office Instagram shows. 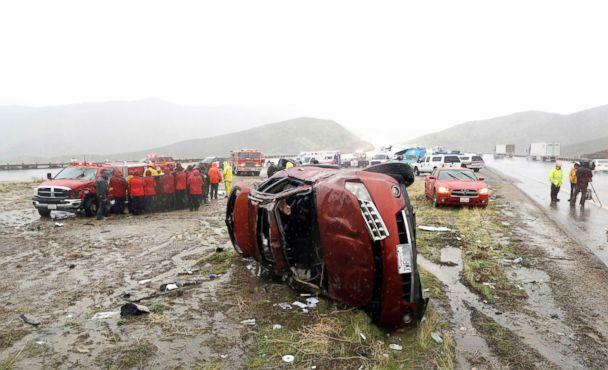 The man was experiencing hypothermia but was otherwise OK, authorities said. 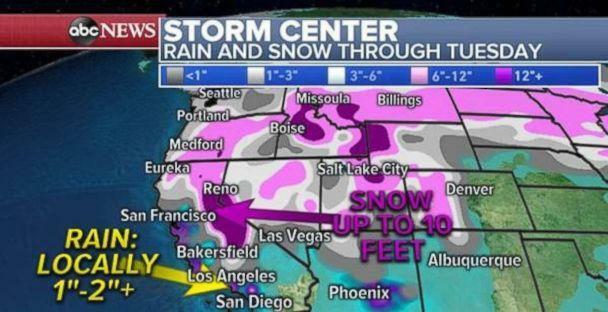 At Mammoth Mountain, nearly 18 inches of fresh snow fell, and a possible tornado was reported in Acton.The rain came at a particularly intense rate, with 0.23 inches of rain in 10 minutes reported in Beverly Hills, 0.31 inches of rain in Malibu in just five minutes, and a half an inch of rain in five minutes in Santa Barbara. 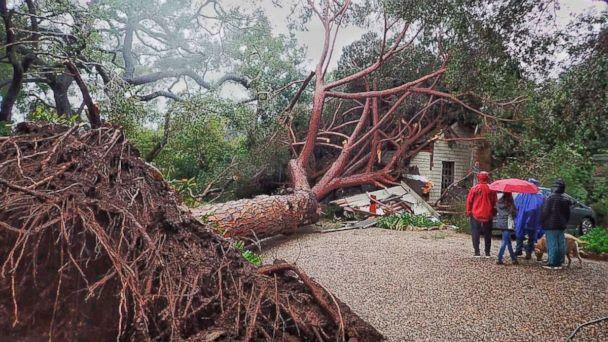 PHOTO: In this Saturday, Feb. 2, 2019, photo released by Santa Barbara County Fire, a large stone pine tree believed to be 100 years old came down into this Santa Barbara, Calif., home during Saturday’s powerful winter storm. (Mike Eliason/Santa Barbara County Fire via AP Farther north, colder air and snow will be moving into the Northwest as well. There is a possibility of some lowland snow in Seattle from Sunday night into Monday morning. Even though accumulations will be light, it could make for a problematic morning commute. That storm will also move inland on Monday, however, it is expected to be less intense than the previous two storms. 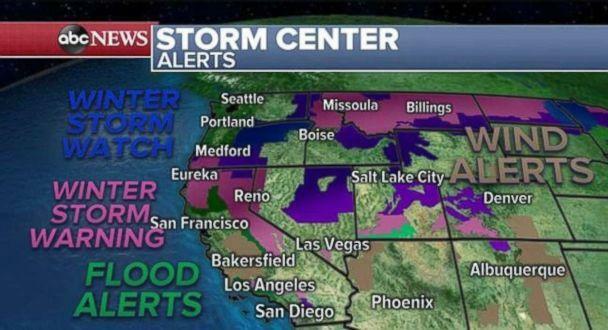 A major warm up is underway in the Midwest after the region dealt with a brutal cold blast early this week. Lone Rock, Wisconsin, which was minus 39 on Thursday, reached 41 degrees on Saturday. That is an 80-degree warm up in 57 hours. PHOTO: Temperatures are completely flipped from last week in the Midwest. 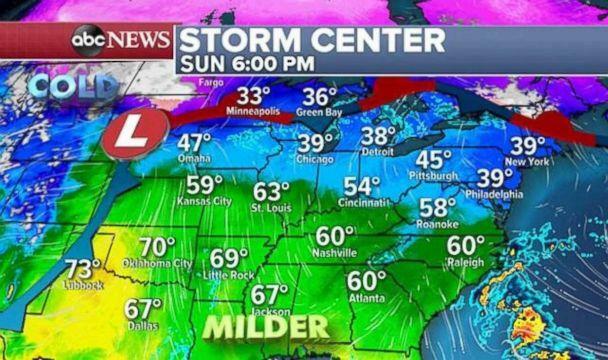 (ABC News) Mild air will keep expanding throughout the central U.S. Sunday, with temperatures reaching nearly 40 degrees in Nebraska, Iowa and Illinois. Temperatures will reach almost 70 from Oklahoma City to Little Rock, Arkansas — nearly 20 degrees above average. Temperatures are in the low 60s to mid-50s from St. Louis to Roanoke, Virginia, about 10 to 15 degrees above average.Some of this mild air will slide east on Monday, with another mild day from Oklahoma City to Detroit. Chicago will start the day in the 40s, but the passing of a cold front will bring the temperature back down into the 30s, which is seasonable for this time of the year. PHOTO: There warmth will expand eastward on Monday. 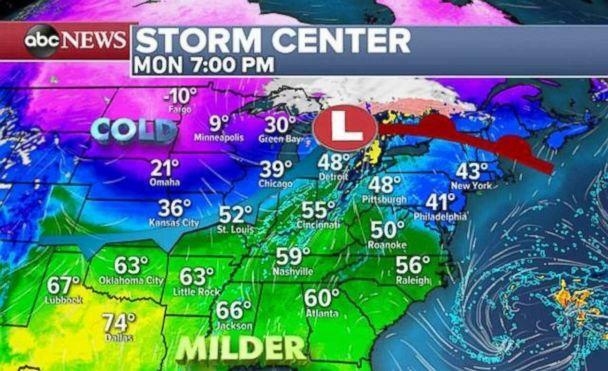 (ABC News) When the milder air reaches the East Coast it will be accompanied by a mix of clouds and sun for the major Northeast cities. The latest forecast guidance shows temperatures will be approaching the 60s by Tuesday, with sun and clouds from Washington, D.C., to Boston.The combination of sunshine and temperatures nearly 20 degrees above average is relatively atypical in this region of the country in February. Additionally, it will likely be the nicest and most comfortable weather this region has seen in months. 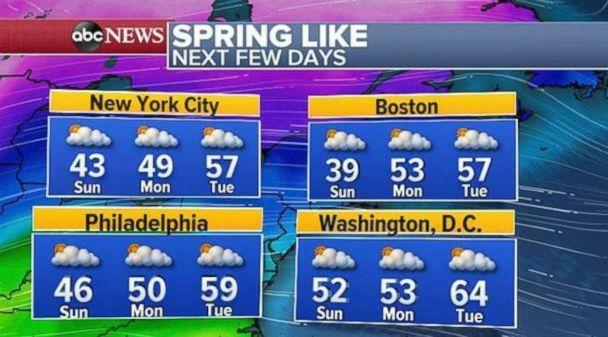 PHOTO: Temperatures will be above average in the Northeast over the first few days of the work week. (ABC News) ABC News’ Julia Jacobo contributed to this report. World ‘Once in a century’ floods hit northeast Australia Telegraph Reporters,The Telegraph• February 3, 2019 Local resident Paul Shafer and his daughter Lily stand in floodwaters near star pickets that show where the storm water cover has been removed in Hermit Park, Townsville – REUTERS Once in a century floods have turned streets into rivers and forced thousands to abandon their homes in northeast Australia, with authorities warning of further downpours over the next few days.Australia’s tropical north experiences heavy rains during the monsoon season at this time of the year, but the recent deluge has surged far above normal levels.Thousands of residents in the city of Townsville in northeast Queensland were without power and up to 20,000 homes are at risk of being inundated if the rains continue.Military personnel were delivering tens of thousands of sandbags to affected locals, as Queensland Premier Annastacia Palaszczuk warned residents to be careful. „It’s basically not just a one in 20-year event, it’s a one in 100-year event,” she told reporters Saturday.The Bureau of Meteorology said a slow-moving monsoonal trough was sitting above northern Queensland state, with some areas expected to receive more than a year’s worth of rain before conditions ease.”We could see the rain intensify into early next week as the low… moves out to the Coral Sea,” meteorologist Jonathan How told national broadcaster ABC Sunday. Rocks are seen blocking Muller Street in Wulguru, Townsville, as flooding continues in northern QueenslandCredit: ReutersThe region receives an average of some 2,000 millimetres (6.5 feet) of rain annually but some towns were already on track to pass that total.The town of Ingham received 506 millimetres of rain in 24 hours between Saturday and Sunday, of which 145 millimetres fell in just one hour, he added.I’ve never seen anything like this,” Townsville resident Chris Brookehouse told the ABC, adding that more than one metre of water had flooded his house.”The volume of water is just incredible. Downstairs is gone, the fridge and freezer are floating. Another five or six steps and upstairs is gone too.”Blazak said that with adverse weather predicted to continue for up to 72 hours, some regions could see record-breaking levels of rainfall.Conditions are expected to ease from Thursday, although the weather modelling for the event could change over the week, he added.